To experience a part of Kenya unseen by most tourists, visit the friendliest slum of the world in Nairobi. Take a tour to Kibera. 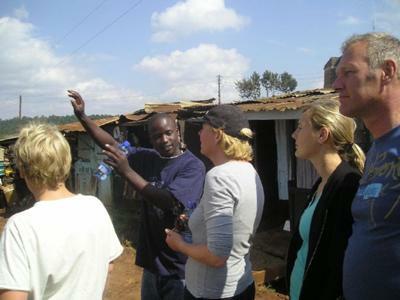 There are guides available, born and living in Kibera, who would like to show you the daily life in their 'city of hope'. See the ways the people of Kibera improve their lives. Become inspired by their resilience and friendliness. You 'll experience that the people of Kibera will certainly make you feel welcome. A security-guard, well-known in Kibera, will come on the tour to make you feel even more safe. * An orphanage/school built by 'mama Tunza'. Meet this impressive woman and look at her work in the childrens home. I've been to Kibera, too. You have to go there with a local guide, otherwise it might not be safe. But I can recommend going there, it's very good to see this with your own eyes. Thank you for your insight! I visited Nairobi almost a year ago, and would have been very interested to participate in a tour of this kind. A definate must on our next visit. I know of the area which you mentioned but never realised we could go there. I hope the visits bring a better understanding to those that go. great to learn humanwastes can be used for better use. I WILL PLAN A VIST TO THAT PLACE AND WITNESS FOR MY SELF.